Chapter 6. How Were the Pawtucket Organized and Led? Europeans had fundamental misunderstandings about Native American political systems and most did not appreciate that the groups they encountered had long and rich histories carefully preserved in oral traditions. Those misunderstandings and general ignorance became embedded in common belief and practice. The discoverers simply transferred European concepts to the people they encountered—for example, imputing the existence of tribes and clans with chiefs and sovereign territories.1 So pervasive was this invented reality that Native Americans themselves gradually adopted it. In reality, however, nothing could be further from the truth. The Algonquians of New England did not have tribes, did not have clans, did not have chieftainships, and did not have sovereign territories! But they did have a long and rich history. In other ways Algonquian and traditional European political organizations were similar. For example, peace pacts and military and trade alliances were cemented through marriage. And on behalf of their client bands, sachems sometimes allied themselves with or paid tribute to a grand sachem (whom Europeans referred to as a paramount chief), especially during times of threat or conflict. 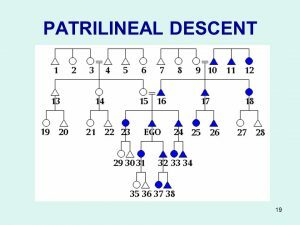 The kin chart shows your patrilineage. Your band-the people you live with-would also include the wives and unmarried daughters of all the males in your patrilineage, 3 or 4 generations of them, assuming they have not started bands of their own, plus any unrelated others who have been accepted into your group. Kidnapping and adopting people from enemy bands was a traditional means of replacing members killed in wartime. If you are EGO in the diagram, your preferred marriage partner would be number 27 if you are male and 28 if you are female, as they are children of number 18, who is your father’s sister. A grandchild of number 12 would also be in the marriageable class. Numbers 23 through 26 are your sisters and brothers. Numbers 19 and 20 are cross-cousins on your mother’s side, while numbers 21 and 22 are parallel cousins on your mother’s side.